EHedger is a full service commodity brokerage firm offering revenue management services for the agricultural sector. Our roots come from Iowa Grain Company, clearing trades on all major exchanges, and advising thousands of professional clients. Our experience comes from generations of farming and hedging. Contact us to learn how we can partner in managing the risk of market volatility and receive a complimentary evaluation of your marketing plan, including your crop insurance coverage. We utilize Agyield’s risk management platform. This technology enables effective collaboration between our clients and our brokers to create, test and execute solid marketing plans. We combine our experience with technology to provide farm revenue management. Our track record of over 45 years of service and stability coupled with revenue management technology put us in a unique position to help you efficiently handle market volatility. As an EHedger client, you will receive a dedicated professional adviser with 24 hour access, morning and afternoon grain commentary, special reports, Oak Trading Software with live streaming quotes, and access to crop insurance professionals. Our technology gives our customers an upper hand while developing and adhering to their marketing plans. Our technology provides the ability for our customers to look at their operations in a way they have never seen before. Through the platform, we can quickly identify potential gaps in the marketing plan and take steps to correct them. As an EHedger customer, you will have an accurate representation of where your operation stands in terms of revenue and profit. You will be better able to understand complex correlations between cash sales, crop insurance and hedging strategies and how they impact your bottom line. Our brokers will help you to analyze your plan under different price/yield scenarios to be able to test your marketing plan against different market scenarios. Create supporting data for loan approval presentations to expand your operation and enhance your banking relationship. 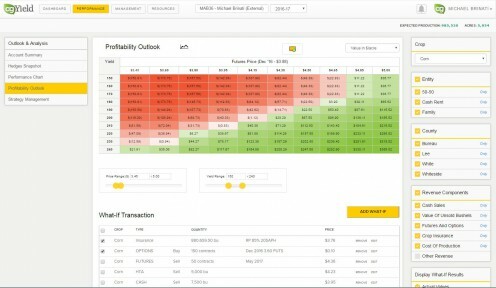 Learn more about the AgYield Platform. EHedger Customers receive daily morning and evening grain commentary, along with special and monthly reports. Our unique position in the marketplace coupled with our industry expertise allows for us to gather insight and information from a wide variety of resources. EHedger is agricultural revenue management firm dedicated to partnering with industry professionals to help them manage their agricultural hedging, merchandising and trading. EHedger was founded by the owners of Iowa Grain Company in 1999 to offer customers superior personal service combined with sophisticated technological solutions. As grain brokers and commodities traders, EHedger is proud of its long-term relationships across the entire spectrum of the agricultural arena. Located in Oakbrook Terrace, IL, EHedger LLC is the ideal link for producers and processors looking to build up their revenue management skills with a partner renowned for honesty, hard work and expertise. Our principals, experienced traders and agricultural experts are intimately aware of the challenges and opportunities encountered in our industry. *Please send all funding checks for EHedger’s IB service cleared through ADMIS to ADMIS at 141 W Jackson Blvd Suite 2100A, Chicago, IL 60604. Opening a branch office could be a great option for you. You will have a blueprint to better serve your clients using industry leading technology available only through EHedger.Contact Us to learn more about the opportunity.